Who can resist a simple and delicious treat on a hot Spring day? I had some of Kim’s famous Peanut Butter cookies laying around so I just used some yummy Peanut Butter and chocolate ice cream to turn them into ice cream sandwiches. It was so easy! You could easily make them ahead of time, wrap them in wax paper, and save them for a big event. I also like the idea to have a build your own ice cream sandwich bar like this one from Yellow Bliss Road. This is pretty much the simplest idea for a deluxe treat! Get creative! 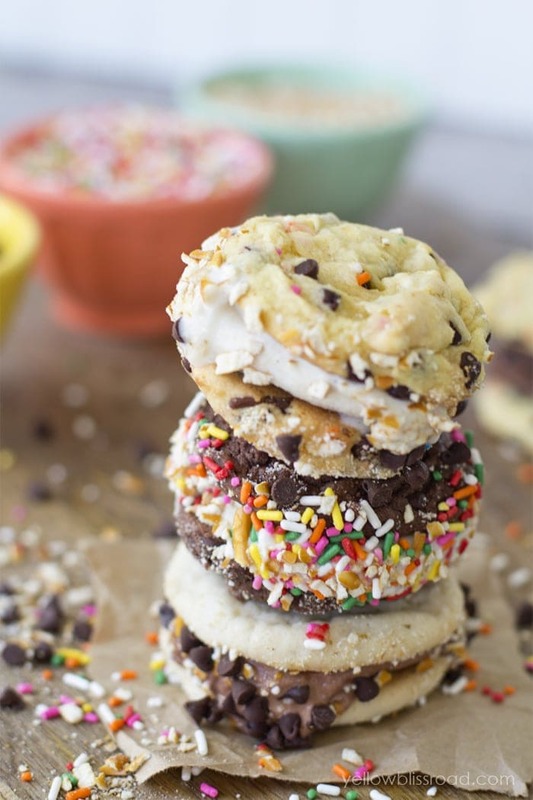 I want to make home-made ice cream sandwiches. I will definitely do this this summer. Right now, I am trying to burn off a few unwanted pounds before summer gets here. Just looking at these pictures put weight on me. lol Nice to meet you through Sverve! Now following you on Google+ and Twitter! These look SO yummy! I stumbled across your page through the link-up party and am glad I stopped by! Thank you for sharing, can't wait to see future posts! Mmm these look so good! The best ice cream cookie sandwich I ever had was at Disney World. They were made with 2 huge cookies and you could pick whatever flavor of ice cream you wanted. I need to try making them at home. Thanks for sharing with Hump Day Happenings! Oh goodness, another ice cream treat to love! oh yeah, those look wonderful…. Yum! Perfect sweet treat for summer! Thanks for sharing at Fridays Unfolded! I am definitely having an ice cream bar this summer! Oooh! I have a 1st Birthday coming up, I think I need to make these. Thanks for linking up at Tips and Tricks. Pinning! I don't think they'd last long here! These are the perfect treat anytime! Oh my goodness … these look so good. Definitely one of my favorite flavor combinations! Oh these look absolutely delicious! My family would love for me to make these – thanks for shareing! Thanks for linking up to The Creative Exchange Linky Party!